All of Caravana's designs are hand-woven using traditional techniques that date back to the Mayan empire. Perfect for both tropical vacations and balmy days back home, these 'Tizimin' shorts are made from lightweight cotton-gauze in a loose, fluttery shape and traced with soft fringing. 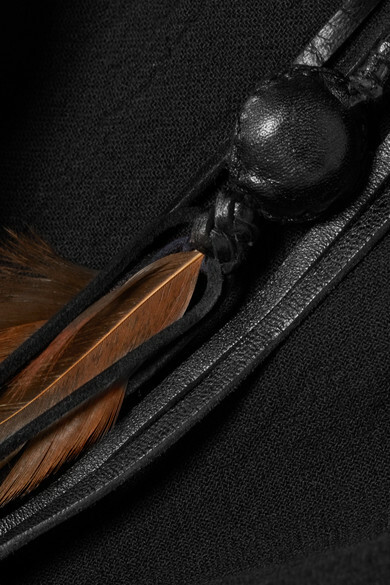 The leather belt is detailed with feathers and tonal mucuna seeds - use it to cinch the smallest part of the waist. Shown here with: Caravana Top, Carolina Santo Domingo Tote, Aquazzura Sandals, Isabel Marant Bracelets, Alighieri Necklace, 1064 Studio Ring, WALD Berlin Necklace, Rosantica Earrings.